We're Kickin Up our Heels and Spicin' Things Up! Weather you like a lot of spice or just a hint. just a something here for everyone. 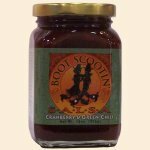 Our special recipe of Cranberries & Green Chilies is simmered to perfect for hours. This sweet-hot salsa has become a favorite and it's not just for chips anymore. Serve it over your next pork tenderloin and you'll be a hit at the dinner table too! Tomato Base (tomatoes, tomato juice, citric acid, calcium chloride, water, onion, jalapeno pepper, salt, acetic acid, seasoning, spices, herbs, hydrolyzed wheat gluten, yeast extract, partially hydrogenated cottonseed & soy oils, natural flavor, guar & xanthan gum, sucrose, potassium sorbate cilantro, 2% or less: calcium silicate & soybean oil), Cranberries, Sugar, Tomatillos, Green Chilies, Port Wine, Jalapeno Peppers, Red Peppers, Spices.